In need of comfort and authenticity? Hivernage Secret offers you unforgettable moments of bliss adapted to your needs. Which city better than Marrakech could embody the eclectism of Secret Suites? The Red city is without a doubt the dream decor to install these true treasures of charm and luxury, where relaxation and wellness is all that matters. Magnificent suite with terrace and stunning view of fountain and interior garden. Majestic & very chic bedding allow you to spend a very good night. The bathroom has a shower, bathrobes, slippers and luxury home products. Wi-Fi access, air conditioning, minibar, safe and expresso machine are available. Beautiful Suite on the ground floor next to the exhibition hall of the artisanal home « Cadeau berbere ». Sumptuous, with a beautiful tadelakt in an elegant and modern decor. The suite includes a cotton linens bedding, a private bathroom with shower, bathrobes, sleepers and home luxury products. Fantastic salon is put in place to enjoy the Wi-Fi access and watching various channels in a flat-screen TV . Air Conditioning, Minibar, safe and expresso machine are available. 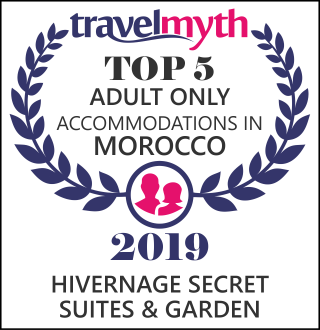 Luxurious suite with a large private terrace overlooking the pool and the beautiful gardens of the Riad. Decorated with beautiful art paintings & precious objects of Moroccan craftsmanship. The suite has a dressing and a traditional stay allowing you to relax in front of the flat-screen TV. Enjoy bedding with cotton linens, a private bathroom with shower, bathtub, bathrobes, sleepers and home luxury products.